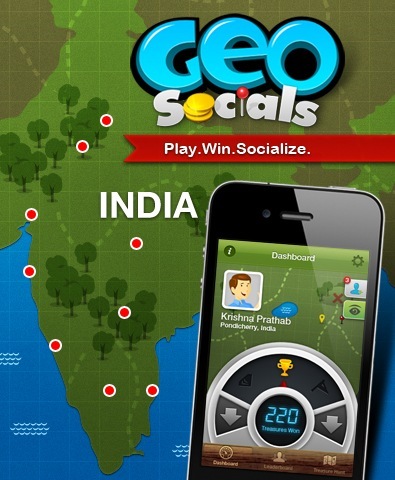 GeoSocials now in India on Android and iPhone! We’ve come a long way since the launch of GeoSocials in July this year. With GeoSocials going live this week, we thought it befitting to release the new and improved version at home with an Android version to boot! That GeoSocials goes live in India is an extremely gratifying milestone for us! We’re really stoked and want to thank the first wave of users (our pioneers!) and the in-depth reviews from our beta-testers, that helped pave the way for the new and improved version. With an initial limited release for the iPhone in the US and subsequent staggered launches across Europe and Asia, GeoSocials has since upgraded the game mechanics with GeoSocials. The new version is currently available for Android devices (Android devices must support Adobe AIR runtime to download/play GeoSocials). GeoSocials new features and upgrades will be made available for iPhone users in the next couple of weeks. Stay tuned via our social channels on Facebook or Twitter for updates. For now, iPhone users can continue to play or download GeoSocials’ current version for the platform here. Subsequent releases for other platforms are in the pipeline. With the latest release, Android users will be able to hit the game with two new features – Vote-a-Deal and GeoSocials Places – both of which are tailored with a twist. For those who haven’t seen our earlier post do read up on our short description of our new features. We’ll be blogging exclusively about the new features in detail – so stay tuned! To start playing download GeoSocials here. GeoSocials now available as an Adobe AIR app on Android! GeoSocials, the location based social game that we released a few weeks back for iPhone is now available as an Android application developed from ground up using Adobe AIR. For those of you who are not already aware, GeoSocials is a real-time, location based, social game played around you. It’s a whole new way of exploring the world around you, meeting new people, and getting rewarded in the process. The broad theme of GeoSocials is Play, Win and Socialize. You can check out more details in our earlier article here. So yes, as promised, GeoSocials is now ready for all you Android fans to download! So, if you’ve got your Android device handy, just make sure that it supports Adobe runtime (GeoSocials can only be downloaded to Android devices that support it) and start blazing your trail! With the latest release, Android users will be able to hit the game with two new features – Vote-A-Deal and GeoSocials Places. Both features are tailored with a twist. Our take on the features was all about revisiting how deals are and will be made in the future and how the places users visit will respond and benefit from all link love users, like you, give it! ‘Vote-A-Deal’ is all about getting the place you love to respond the kind of feedback, loyalty and affinity users have and give. Using this we intend to get users to decide where they would like a deal and help them score one! GeoSocials Places enhances users’ game play tactics by leveraging their favourite places as GeoBuddy sites, a special treasure drop zone or even utilize their brand loyalty for the ‘Vote-A-Deal’ feature. We’re going to continue to evolve GeoSocials as we expand the platform availability and we’d love to hear back from you after you’ve signed up and started unlocking your world one neighbourhood at a time! All of the developments present and future, will always be designed to facilitate players to make instant and real connections with people both in terms of physical proximity and established social connections. At its heart, GeoSocials is about evolving our social relationships from the virtual space to the real world we live in. It’s always been about that for us. 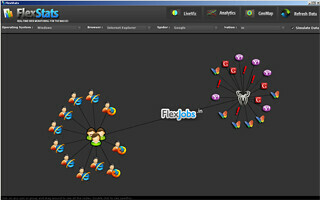 In addition to challenging their friends or new acquaintances to a friendly real-time hyper-local game, users can now use the two new features to further heighten their social-game experience by allowing them to wish-list a deal via vote, visit the place in person for an actual game-hook-up, or even expand their game outside of their city via the game platform to a social level by exchanging and posting updates or notes, recommending the same to new friends or even highlighting an event, product or personal experience, all in real-time. Remember to check your Android device for Adobe AIR runtime support, but most importantly, get cracking and HAVE FUN! GeoSocials can be downloaded via this link for both iPhone and Android: www.geosocials.com/download.